Despite being a scaredy-cat and crybaby, high schooler Tetsu Misato finds himself working at the eerie estate on the hill, where Shizu—the only child of the Karasawa family—is secreted away. However, his friendship with Shizu quickly turns to fear when several spirits of the dead appear before him, borrowing her appearance. As he struggles to find the humanity in her supernatural condition, Tetsu must also face a question at once terrifying and heartbreaking: What if the true Shizu never returns? 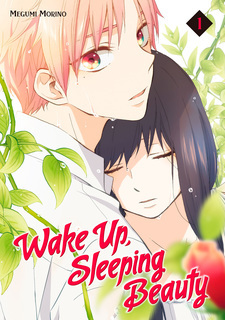 Ohayou, Ibarahime has been published in English as Wake Up, Sleeping Beauty by Kodansha Comics USA since December 5, 2017. It's not really easy to find a decent shoujo manga to read that fits to our tastes, whether for male or female readers. Sometimes we just read the manga when the manga is quite popular and we've heard the good reviews about it. If you're lucky enough, you'll find a hidden gem like "Ohayou, Ibarahime" or "Wake Up, Sleeping Beauty". When you first time see the manga cover, you might think it's an average shoujo manga but ... it's not like your regular shoujo manga with a far-fetched and overly lovey-dovey story. We need something different sometimes. A sorrowful story with a realistic storytelling and of course a good romance approach. What's on your mind when you heard "Sleeping Beauty"? Probably a story about the princess who fell into a deep sleep for a long time being kissed by the handsome prince in order to woke her up. But ... this is not your regular "Sleeping Beauty" story. Let your wildest imagination fly to the sky. The story follows Misato Tetsu, a highschooler who works at the mansion as a part-timer, and Karasawa Shizu, a mysterious girl who lives in the lodge on the other side of the mansion. Tetsu is our main hero in this story. With his calm and caring nature, who doesn’t like him? He’s warm and friendly person. Sometimes he can be silly when facing something outside his predictions, but he’s also a responsible person. He always does his job well. He's the best boyfriend material. How about main heroine? Is she a typical spoiled princess? I don’t think so. She’s a gloomy girl and never leave her room in the lodge, because she is said to have a “personality disorder” so she’s told not to leave her room. Does she have a “personality disorder”? Or, is there any secret behind the vicissitude that befell her? Their story begins with an unexpected meeting. Tetsu lost his stuff so he searched around the mansion. Finally, he went to the lodge where the girl lived. When he got there, all he found was a normal girl who’s cleaning the room. There’s nothing unusual about it. After talking for a while, he asked Shizu out to see the shooting star. They came out through the wall with stairs so that they were not known by others. After they arrive at the open field, Shizu is amazed to see shooting stars and start crying in happiness. After that, Tetsu conveyed his feelings to Shizu. However, Shizu didn’t give an answer and told Tetsu to say the same thing when he came to her lodge. When he came there he found Shizu lying on the bench. She got up and said “Who are you?” to Tetsu. What happened with her? I think it’s pretty hard to tell what’s going on in this manga without give some spoilers, especially the thing I described below. I’ll try to make the spoiler as small as possible. Shizu is possessed by four spirits. They change roles at certain times in Shizu’s body. Sometimes her personality is like an adult man, sometimes childish like a young boy, sometimes like a popular girl, and sometimes she acted calmly like an old man. That’s why her personality changed all the time. The previous servants of the mansion can’t deal with it. Only Tetsu can handle it. Even though he afraid to face things he usually fears, he tries his best to make Shizu can live normally and showing feelings that have long been lost from her. The main focus of this story is how to cast the spirits out from Shizu’s body. Not by exorcism, but by understanding the feelings of the spirits so that they can rest peacefully and leave her body without hatred. The romance is not the main aspect of the story, but the romance is a way to understand how to treat Shizu with her “disorder” and make her live the life without a bad stigma. I feel like I read a mature (seinen/josei) manga with shoujo touch. There’re so many scenes with deep meanings in this manga. We can see the character development clearly in this manga. The main or side characters have their respective development. Shizu, who previously feel inferior to her personality, slowly change thanks to Tetsu who is always by his side to accompany and find solutions to the problems faced by her. Whereas Tetsu, who previously has trauma from horror things, getting used to supernatural phenomenon caused by spirits who possessed Shizu. They’re both stronger than before. Every charactetrs in this manga are likeable and have their own charms for the readers because of the well-written back stories and good characterizations. When it comes to the art, there’s nothing to complain about. It’s really good and well-drawn. Character expressions are drawn clearly and not overdramatized. I love how the creator draw blushing characters. It’s really cute. Smiles, tears, and sadness of the characters are depicted in a pleasant way. Just perfect. The comedic art is hilarious. Every time I read it, I always feel happy. I never felt bored when reading it. The cover is one of the aspects whether the book is interesting to read or not so the cover becomes a crucial thing to think about. As the author stated on volume 6, there are different themes in every volume covers based on the flower meanings, especially roses. We already know that roses are a symbol of love and passion. There’re specific meanings of roses based on the colors. I’ll try to explain the correlations between them. ● Volume 1 is symbolized with red roses that represent everlasting passion. The love story between Tetsu and Chizu starts here. ● Volume 2 is symbolized with yellow roses. This flower expressing friendship and great pleasure. This volume reveals the relationship between the main characters and those around them. There’re some heartwarming scenes here. ● Volume 3 is symbolized with white roses that represent modesty and purity. Tetsu starts to be honest with his feelings about anything, not just about his love for Shizu. In the other hand, Shizu is like an innocent child who is always curious. Her eyes opened by Tetsu to see the world she never known before. ● Volume 4 is symbolized with purple roses represent allure and love at first sight. The seeds of love slowly grow into trees. Their feelings go deeper in each other’s heart. ● Volume 5 is symbolized with blue roses that represent the desire for the unattainable and zinnia, the flower of longing. You’ll find many emotional scenes and you’ll experience of losing someone after you finished reading this volume. ● There’s no explanation about volume 6, but we can see Tetsu and Shizu in happiness and embracing with a bouquet of flowers in the middle. We can find out just by looking it. They live happily ever after … Sounds like your regular Sleeping Beauty, huh? But the story is far beyond it in my opinion. 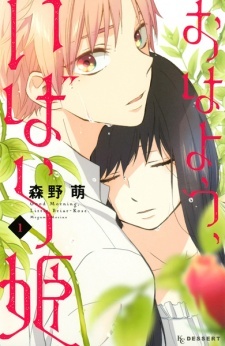 The creator of this manga, Morino Megumi, has manifested the meaning of flowers on her manga well. When some of mangaka don’t think about the philosophy behind the cover and draw it just for aesthetic purpose, Morino-sensei think about it deeply. I think it’s a good thing the mangaka has. Overall, I would recommend this manga to shoujo manga fans and casual manga readers, or even who never got into shoujo manga. You can feel delighted, depressed, and empty at the same time because of emotional scenes there. The story can drag us in depth. You won't regret anything. I like how the mangaka involves side characters not only to connect stories, but as characters that are on par with the main characters. The conclusion of the story is also satisfying – a closed ending that doesn’t need a sequel. With a good storytelling, I hope the mangaka doesn’t stop to make a good manga for the reader. I’d like to follow the other works of the creator. I’m open with opinions and suggestions. Don’t be shy to give a comment on my profile about this review. I already wrote a review on this on Google Play books, but let me just write another one for the manga that is seated #1 on my list. Reading the chapters was one hell of a rollercoaster. I was swooning, then I was frustrated. I was laughing. I was reflecting. Then I was swooning again. It's not that surprising anymore that my tears were spilling. If a manga made me show this much emotion, then it's definitely a masterpiece. It's honestly incredible and quite unique. I thought it was just gonna be your typical high school love story, ya know? The usual clichés the shoujo genre would have. I expected nothing else. So I was thinking of dropping it, but it turned out to have a twist, and that's what left me wanting to read more. Personally, this manga hit so many marks on me. Especially near the 'kokoro'. The family arguments were heartbreaking. But in the end, a family will always find a way to stay family. Don't underestimate that bond! The romance was sweet; not too rushed or overly cheesy, neither was it too slow or minimal. For Tetsu and Shizu, they ran at their own pace, and definitely had a handful of support from their families. That supernatural twist is probably one of the major points in the manga. Though it's not anything huge like 7 feet three-headed demons, I think with this, it keeps the story balanced. Also, the art is neat and charming! I really adore Morino-sensei's style. This is one of the few mangas I'd consider recommending to others — however, I don't think many people know about 'Ohayou, Ibarahime', so now that I've found it, it's kinda like I want it to stay a hidden gem. 'Ohayou, Ibarahime' was hard to put down. I've become so attached to this manga, and I'm sure I still will be in the future. When I first started reading it, I didn't expect this plot. If you want a new idea for a story, I highly recommend it. I loved the art, It's really well drawn. But most of all, all the characters in this manga developed really well. starting with the main FC, she war really isolated, living alone, rejected by her own mother & father (maybe a spoiler: they feared her). When the main MC got into the picture, her entire life changed, also his, despite his first reaction when he saw "her special condition"
Overall, I really enjoyed it, I laughed, I cried, I was frightened and I was very happy at the end. I hope you can enjoy it as well. This is truly one heartwarming manga with a unique and well thought out story line. When I started reading it I was expecting it to go to a certain direction but it completely changed its direction. The art is really pretty. If you’re picky about art styles then do give this a try because I really liked it, for me being quite choosy about art styles. Shizu, who nobody knows really exist but have heard, lives alone in a mansion which is different from the main mansion where her parents live. A boy named Tetsu starts his part time as a housekeeper in the main mansion, but then he comes across Shizu and gets to know her secret which may be more than just a multiple personality disorder. And the journey of how he helps her to overcome her problems, the loneliness and start building up everything from nothing. All The characters are lovable. If you’re a big shoujo fan and want to read as many mangas out there definitely check this out. Even if you’re new to the genre do give it a go for it’s nothing like your usual genre and not predictable either. You’d expect certain things to happen but they may not. Overall it’s a good read! Would love to read it again someday.